My second year in college, my grandpa gave me his only car so I could have it in California. Three years later, driving home after graduation, I totaled it. Eight months after that, I was driving the mustang he had bought my sister, when I totaled that one, too. grandfather, Donald R. Anderson, was a good man. 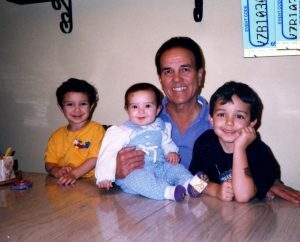 Growing up, he was the only grandparent I knew–the other three passing before I was blessed to truly meet them. Thus as a kid, I assumed all grandparents were like mine: stoic, fair, and able to use electrical tape to fix anything. As a kid, I used to spend a lot of time at his house with school so nearby. And there, he taught me how to ride a bicycle. He made me a scooter out of plywood, old skateboard wheels, and a couple of tin cans. He put calamine lotion on my every injury. He gave me peanut butter cookies in secret. He watched me fall in love with the girls who spent their summers across the street, and watched as my heart broke when they didn’t come back one year. His favorite beer was good ol’ American Budweiser–but none of that “light crap.” With every hug, he’d pinch your sides for an on the spot body fat analysis, my typical reading: “You’ve been eating good, haven’t you?” As a kid, he always disappointed me with oranges in my Christmas stocking, and as an adult, he read every single one of my blog posts. He was efficient when speaking, accurate when giving directions, and when I was a kid, he forever gained my respect when he decided to stop dying his hair and let it go gray. My grandpa was a good man. He lived a good life. Granted, I’m a biased source for without him, I literally wouldn’t be here today. But I know the people who knew him will miss him; the shared memories that waken smiles will also waken tears. But heaven has its reasons our reason knows not of. But I imagine that squeak in the pearly gates had something to do with it, no one on earth more equipped to squirt a little WD-40 on the hinges. Good one jake. I can’t see for the tears in my eyes. You nailed it … We all loved him. He is gone but forever in my heart. Thank you for the kind words, Patty 🙂 It was great to see you while in town.